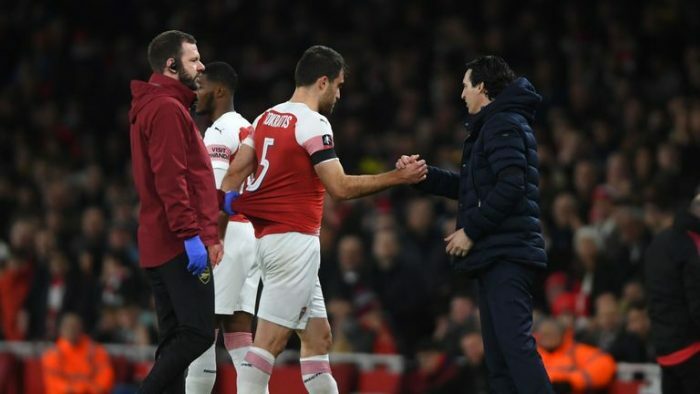 Laurent Koscielny and Sokratis Papastathopoulos left Friday’s FA Cup clash with Manchester United due to injury, further worsening Arsenal’s defensive crisis. Arsenal recently lost Hector Bellerin to injury as the fullback has been ruled out for up to nine months after rupturing his anterior cruciate ligament. Arsenal fell to the Red Devils 3-1 in Friday’s FA Cup clash with Lingard, Anthony Martial and Alexis Sanchez providing the goals for Manchester United in a match where the two key defensive pieces were forced out. “I’m happy because I think our work is good, but the result is bad,” Emery said after the loss. “Today it’s the result and the injuries. They don’t help us to be in the match, maybe when the result’s 1-2. In this moment we had the possibility to grow and to win, but these injuries – especially the one to Koscielny – didn’t help us because our rhythm went down. “Also, we needed to change different players to play at centre back. They were very clinical today and in the moments when we attacked, we got into the box but couldn’t produce the last action to score.